Ms. Barton is a skilled and compassionate estate planning attorney who believes in helping people create a lasting legacy that maximizes their lifetime of achievements. She works to simplify the estate planning process and uses common sense and her many years of experience and knowledge to do so. To arrange for a confidential consultation with Ms. Barton, call our probate and estate planning law firm by dialing (760) 834-0444. egrity to find the right solutions for each client. Our estate planning lawyer works to create lasting legacies and simplify the legal process. If you are in Rancho Mirage or a nearby community of Southern California and would like a private consultation, please call the estate planning and probate law firm of Sheila J. Barton at (760) 834-0444. Ms. Barton uses a personalized approach to each case in order to effectively identify the best strategy for attaining specific client objectives. Rancho Mirage Estate Planning Attorney Barton works to ensure client wishes are properly recorded and respected. She draws on her knowledge of estate law and 30 years of experience to minimize tax liabilities and maximize wealth. Estate plans are also carefully crafted in order to avoid unnecessary litigation in the future. If an individual becomes unable to make medical decisions for themselves, an advance health care directive will enable a previously designated agent to do so. 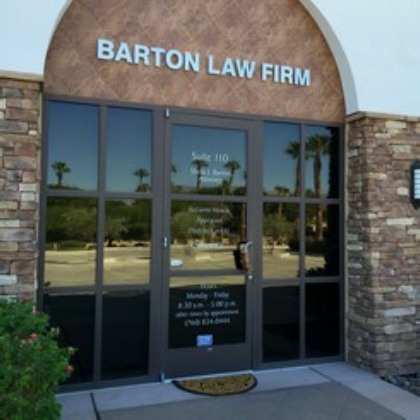 Rancho Mirage Estate Planning Lawyer Barton creates complete advance health care directive documents that give clients and their families peace of mind over future health care matters. A durable power of attorney allows a designated individual to handle specific financial matters on behalf of another. This can be used in a variety of situations, including in the case of incapacitation. When a durable power of attorney has been established, lengthy court proceedings will no longer be necessary to appoint a conservator. When a family member passes away, the rest of the family could become burdened with complex estate matters. Rancho Mirage Probate Attorney Sheila Barton can take care of virtually all probate issues. This includes paying creditors, collecting assets, gaining appraisals, preparing probate court documents, liquidating assets, notifying heirs, and more. Estate Planning Lawyer Sheila J. Barton provides complete litigation services. Her experience and skill enable her to resolve complex estate cases. As a reliable probate litigation lawyer, Ms. Barton represents clients in cases that involve breach of fiduciary duty, inheritance disputes, will contests, the valuation of assets, and other matters. A properly drafted and executed trust can protect client wishes regarding wealth and the legacy being established. Trusts Attorney Barton tailors trusts to each family’s specific needs, values, and circumstances. She uses various legal tools such as special needs trusts, spendthrift trusts, revocable trusts, charitable trusts, and irrevocable trusts to accomplish client goals. Barton Law Firm assists families with a variety of trust administration issues. If you have questions about the distribution of assets, trust accounting, trust liquidation, or creditor claims, call Trust Administration Lawyer Sheila Barton. She has the experience needed to provide trustworthy guidance to trust administrators. Having a clearly stated and enforceable will can protect the fiscal well-being of your family. Wills Attorney Barton helps families avoid future conflict and stressful courtroom litigation by offering sound guidance. A proper will directs the handling of assets, appoints guardians for young children, and indicates how other vital matters will be handled. Rancho Mirage Estate Planning Attorney Barton and our estate planning firm help individuals and families protect wealth, reduce tax liabilities, and avoid future litigation. Ms. Barton creates individualized estate plans that enforce client wishes. With her skill and experience, she helps clients gain peace of mind about future financial and healthcare matters. Attorney Sheila J. Barton is also a capable employment attorney. If you are an employee involved in a dispute with your employer, call our firm to discuss your case. Our estate planning and trust lawyer helps preserve client wealth and values. For comprehensive estate planning, call our firm.